Musings from an opinionated mama about life, love, family, marriage, kids, homemaking, couponing, & more! “There's no place like home” might seem like a cheesy quote from a movie to some, but to us it's now the story of our lives. Tuesday, January 7, 2014 we were having our nightly dinner together in our kitchen that was just starting to come together after living in our home for nearly 5 years. My custom built spice rack that my husband made me (I collect spices... and salt & pepper shakers...) adorned the wall, my brand new KitchenAid (in raspberry ice color) that I'd been saving up for, for what seemed like forever sat proudly atop the counter, and we had just finished saying the blessing when we heard what sounded like a huge metal appliance falling upstairs. Immediately, I rushed upstairs to look around thinking either: my 10 year old son left something too close to the edge, or worse – there were burglars scaling our home and knocking things over to gain access. Oddly enough, I found nothing out of place and all windows secure. Very strange, but we moved on with our dinner and our night, even trying the “boiling water experiment” that we saw on Youtube earlier that day, as it was the perfect night for it – absolutely freezing outside. Little did we know, the freezing temperatures were up to much sinister acts than just turning a measuring cup of water into a puff of fog on our front lawn. Fast forward to the morning of Thursday, January 9, 4:13AM. I awoke suddenly, and just couldn't fall back asleep. This wasn't a huge freak occurrence, as I toss and turn sometimes, although, I kept hearing little noises that kept me stirring. I heard a dripping sound, with the occasional popping sound thrown in, and although I've told this story at least a dozen times, I have chills writing it out, and my eyes are welling with tears. In my half-asleep stupor, I convinced myself I was hearing things. At the very least, maybe my mother (who lives with us) was up making coffee (she loves her coffee) and messing about in the kitchen. I couldn't shake this strange feeling though, and to my horror, would soon find out why. I checked my phone close to 5:00am, and was elated to see a “Best Offer” bid on the car we had been trying to sell on eBay. I was thrilled because we were hoping to sell our car and use the money for tires and other much needed repairs on our family vehicle. Not even 2 minutes later, I was startled by the loudest series of noises I'd ever heard. I can't explain the sound, except that it was probably the most frightening thing I've ever heard in my life. All sorts of thoughts raced through my mind, as my husband startled awake and we both looked at one another for a moment before he jumped out of bed to turn off our air purifier (which we use as white noise mostly, to help us sleep) and listen closer. Terrified, I asked my husband what was happening, and moved my daughter over as I slipped out of bed to follow behind him and inspect the house. As we opened our bedroom door, I could hear what sounded like a waterfall and immediately I felt both relief and horror. Relief that, it probably wasn't someone (or something, like a car or airplane?) breaking into our home, and horror because my first thought was that our dishwasher had fallen out of place (it wasn't all that secure to begin with, and sometimes when my toddler would lean on it, I would fear the bolts coming loose), and there was going to be some gushing water to stop and clean up, and I may have to wash dishes by hand for the next few weeks. Most nights, when my husband goes to bed after me, he leaves every light in the house on (“Were you born in a barn? !” is an recurring expression around here.) Tonight though, I am thankful that he left the lights on, because what I felt and saw would have been tenfold more frightening in the dark. My feet became wet as I walked down our short hallway, and I paused, horrified at the entrance to our once beautiful kitchen. I instantly regretted hoping it wasn't the dishwasher, as that would have been a cake-walk compared to what we are dealing with now. “The sky is falling” immediately came to mind, as the majority of our kitchen ceiling was now on the floor, and there was a cascade of water flowing from above. Everything from there on felt like some sort of dream, and my memory is still fuzzy. I called 911, and we quickly got everyone out of the house, and ran back inside to grab some important documents/items before the local police arrived and very sternly shouted “Everyone out of the house, now!” as another big piece of ceiling crashed down out in the kitchen. My mother-in-law thankfully lives right down the road, and our car battery was frozen from the cold, so we called her to pick us up and get the children out of the cold, early-morning air. After talking to the police, a plumber, and a few other people, we found out that a hot-water pipe (used for heating our home) had burst (probably the other night, when we heard the first loud noise) and our whole first story ceiling had been filling up with water up until it gave way under the pressure. We have been furnished a 30 day hotel stay by our home insurance company, and are thankful for that and also for our family who have been very supportive, but we feel a great deal of sadness and loss for our home. I am praying that this is fixable, and that we can have our beautiful home back, but in the mean time we are dealing with a wide range of emotions and confusion. The most important thing is that we all made it our with our lives. I know that God was protecting us, because that water could have broken through anywhere, it could have been in our bedroom, which is not even 10 feet from the kitchen. We have plaster walls/ceilings, and plaster is very hard, and could have easily killed or badly injured someone. The plaster that fell dented our microwave, and several other kitchen items, and yanked our ceiling fan and lights from where they were suspended. We immediately called to have our water and electricity shut off, so that we could avoid a possible electrical fire or further damage. Our insurance company informed us that there was a great deal of burst pipes and damage in our area, as temperatures reached the lowest they'd been since 1994 this week and have been causing many problems. I have to wonder though, was everyone's damage this bad? Our home is uninhabitable at this point, and we don't truly know the full extent of the damage as I write this letter. I am hoping that the insurance company will be able to make things right, and that all repairs will go smoothly, so that we can be back in our home soon. I don't know how everything is going to pan out, or what's going to happen to our home. I know for certain our entire downstairs ceiling is likely going to be torn out, along with our flooring in the kitchen, hallway, and possibly living room. We are unsure about the walls yet, or what other areas might have been compromised, as there was water in our basement also last time we checked, and the ceiling by our stairs going upstairs has a hairline crack with water leaking as well. My husband is between jobs right now, currently laid off, and everything is stacking up against us. Our faith, however, is unwavering, and we are praying and waiting for a miracle. Preheat cast iron (or whatever you're workin' with) skillet over medium-high heat w/ a small bit of Olive Oil or Pam to prevent sticking. Also preheat oven to 375F. Remove chicken from fridge, and let it sit 20-30 minutes to take off the chill slightly. Generously sprinkle chicken w/ Adobo & Pepper. Place chicken in hot skillet, a few pieces at a time, do not overcrowd. Peek at the underside after several minutes, and when it's nice and dark brown, flip it over to get the other side browned well too. Remove to a 9x13 oven-safe casserole dish, and repeat with remaining chicken. Using about 1/2 jar of each (Sofrito & Recaito) spread them evenly over the browned chicken. Dump both cans of Rotel evenly over top of the chicken. Cover your dish in foil, and place in preheated oven, for about 45min to 1hr. Meanwhile, bring a stockpot of water to a boil. Add your chicken bullion. Once your water is at a rolling boil, cook the Orzo according to the package. Drain Orzo once cooked, reserving 1/2 C cooking liquid, and return it to the stockpot. Stir together Orzo & ingredients, and keep warm until the chicken is ready. 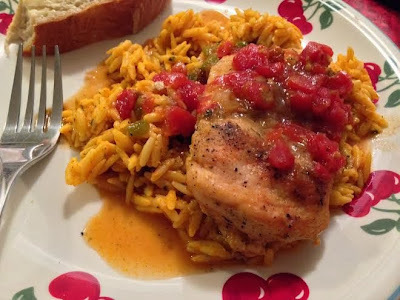 When chicken is ready, spoon a large helping of Orzo onto a plate, and top with chicken, tomatoes, & liquid from the casserole dish. It was one of those days... We slept in until 11:30am (yes, my 18 month old loves to sleep, be very jealous), which led to a late nap, waking up around 6:30pm and panicking with thoughts of what's for dinner... I immediately ran to my freezer, and after gazing upon the last two lonely, frozen chicken breasts from last weeks stock-up sale, I had a vision. No, I had a dream. I had a dream that I could feed 6 ravenous carnivores with these 2 solitary chicken parts. Anyway, back to the point. 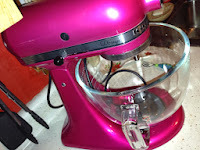 After employing a basic pizza dough recipe (in my shiny new Kitchenaid *see right) I was ready to go. This recipe might seem intimidating, and it does take awhile because there are so many steps, but I made FOUR good sized pizzas from this, and it could be easily doubled, or tripled, and the ingredients keep well either in the fridge, or in a air-tight freezer bag, for long-term storage. Pizza ingredients freeze wonderfully, and are great for a quick, last-minute dinner! Enjoy! Fill the mixing bowl you'll be using with hot/boiling water, to get/keep the ingredients warm. Let the water sit about 30 seconds, then dump it out and begin. This will help your overall rise. Mix the warm water, yeast, and sugar together with a whisk, and let it sit about 5-10 mins until foamy. Add in the rest of the ingredients and either set your mixer to 2 (lowest speed) for 5 minutes, or mix and knead by hand 8-10 minutes. Grease a warm bowl and place your dough inside, and set it inside of a warm (not hot) oven to rise for about 1-2hrs. After it's risen, flour your hands and the counter lightly, remove the dough and divide into 4 equal sections (or however many you designed the recipe for). Form a ball with each section, by stretching and pinching the dough until smooth. Roll/flatten each ball into a 10-12 inch circle. The easiest way to do this is to roll it out as far as you can, let it sit several minutes for the gluten to settle, then roll/press it again to desired width. Place a generous amount of cornmeal or semolina on your pizza peel (or flat cookie sheet) and transfer your dough to it to. Preheat your pizza stone in the oven. I crank my oven up all the way (500F) and let it preheat atleast 45minutes. You want it HOT so that your crust starts cooking immediately. If you don't have a pizza stone, GET ONE! Using a filet knife, or something really sharp, make thin cutlets of the chicken. Season the chicken cutlets with salt, pepper & paprika, and place it in a skillet preheated to medium-high. The chicken should sizzle as soon as it hits the pan if the pan is hot enough. Fry the chicken for 4-5 minutes per side, until it's nice and browned and cooked through. Remove to a plate and set aside to cool. After cooled, chop the chicken up into bite-sized pieces. Add some olive oil to the skillet, and fry your diced pepper for a minute or two over medium-high heat aswell. They should immediately sizzle, and brown/soften quickly. Now you're ready to assemble your pizza. Rub a small amount of olive oil over your dough, this adds flavor and also keeps the dough from soaking up too much sauce and getting soggy. Place your toppings. 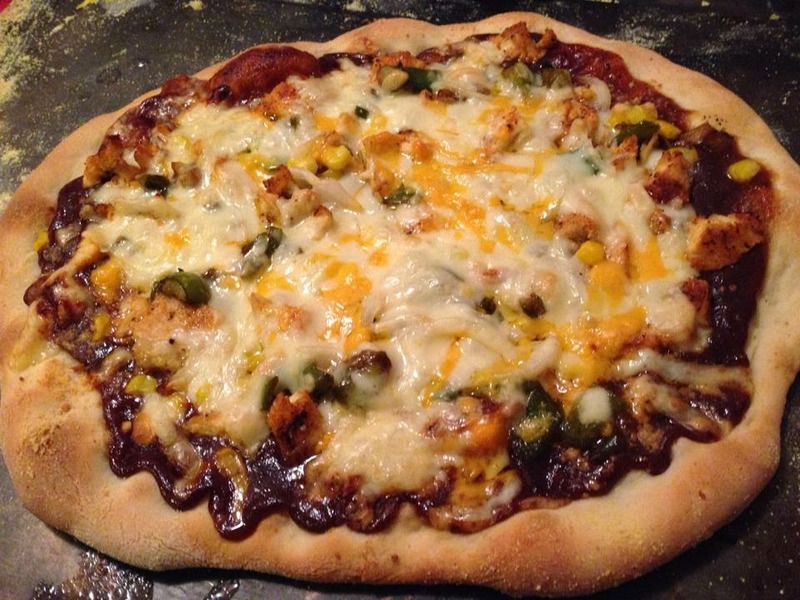 BBQ sauce first, then parmesan cheese, chicken, pepper, corn, raw onion, and cheddar. Turn your oven down to about 450F, and dust your pizza stone with a bit of cornmeal, be careful it's HOT. Slide your prepared pie off of the peel/cookie sheet and onto the pizza stone. Cook for about 12-15 minutes, until the crust is slightly golden brown. You don't want it to cook too long, or it will make the crust too hard! I use tongs to slide my pizza off of the stone, back onto the cookie sheet when it's finished. From there I just let it cool a few minutes, then slice and serve! Yum! Mix everything in a medium saucepan, bring to a boil, then turn down to a simmer for about an hour or until thickened. I actually ended up adding a bit of cornstarch to thicken it at the end, because I'm impatient, but you can let it cool and it'll thicken up a bit too. Brown the meat in a skillet over medium-high heat until browned. Drain fat & discard. Remove meat to a bowl and set aside for now. Heat bacon grease in the skillet, add onion and garlic and cook until tender. Add beer and bring to a boil, scraping bottom of pan to get all the brown delicious crusties. Add remaining ingredients and bring back to a boil. Cover and simmer for 2 hours. 7. Add this mixture to the chili, mix well, cover and cook for another 20 minutes. 8. Serve with cornbread & butter on the side, with toppings of choice (sour cream, cheese, Frito's, etc). *Notes: Last time I made this, I used half ground beef & half ground steak (Tyson Grilled N Ready Steak, ground up in blender) and it was SO tasty! Check out my other posts for everything from recipes, rants, ideas, homeschool tips, & more! Just keeping this page as a way to collect some of my favorite quotes! We don't make a habit of eating out too often, because it's way cheaper (not to mention healthier in most cases) to make our own food! However, when we do eat out, one of our favorite places is Red Lobster! Cheddar Bay Biscuits are a huge part of this decision! I try to limit myself to one or two as to save room for the upcoming appetizers and main dish, but it's so difficult! 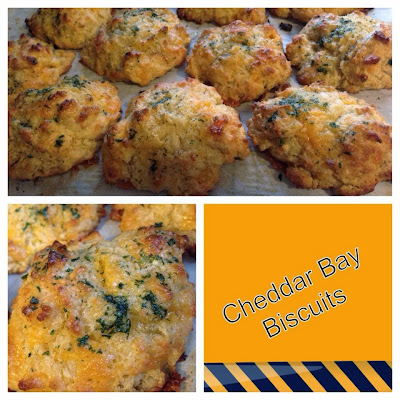 These biscuits are heavenly, especially when they're fresh and hot! The great thing about making them at home is that they can always be fresh and hot! 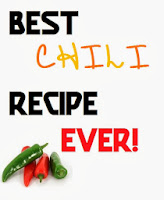 This recipe is super easy, and DELICIOUS! The secret to these, I think, is a trick that I've picked up over the years in making pie dough, and other "flaky" delicacies (grating frozen butter, working quickly, and minimal mixing). I found the base for this recipe over at Brown-Eyed Baker's blog and just tweaked it until I found it perfect. My husband couldn't stop eating these, and when asked how they compared to Red Lobster's version, was heard saying "They're even better!" 475° for your oven. Line a nice sized baking sheet with parchment paper. Prepare your buttermilk (as directed above) so that it's ready when you are. Sift together your dry ingredients until very well combined. Add in the grated cheese, a little at a time, mixing to combine so that the cheese doesn't clump up. Once your butter is frozen, remove it from the freezer and work quickly! The butter will immediately start to soften/melt, especially as you hold it in your sweaty paww, so time is of the essence here. Grate your butter with a hand grater - over your bowl, like the cheese - a little at a time, stirring often to coat the butter shreds with flour mixture, to ensure it doesn't clump up. Add your buttermilk and stir only until all ingredients are moist. You will end up with a final product that even your dog will be ashamed of if you get carried away mixing biscuits, you biscuit mixer you. Say that 5 times fast. Bixing Miscuiter. These are drop biscuits so do the right thing and drop them, onto your baking sheet. I ended up with 9 biscuits one day and 12 the next, so it really depends on what size you make them and how precise you feel like being. I just eye it up, and you should too, if you value your sanity. Bake these lovelies for 8-12 minutes, until the edges are golden and the scent overwhelms you to the point where you are considering the repercussions of reaching into the inferno known as your oven and taking a bite now. It's not worth it buddy, you'll need those taste buds for what's coming. While the biscuits are baking, mix your topping ingredients and set aside. Remove your biscuits, immediately brush with the topping & let them sit 4-5 minutes on the sheet, then remove to a cooling rack to finish - um - cooling. We are impacted by everyone we meet and every experience we have, in one way or another. Sometimes we can be influenced by those we have never met, but have read about or know of. Those influences can be either good, bad, or neutral. Usually, those who make the biggest impact on our lives will be remembered for always. I chose the people on this list because they have made an impact on my life in one way or another. I honestly don't think of myself as a very easily influenced person, but I wanted to do this challenge, so I'm just going to go with what pops in my head! Jesus. He died on the cross not just for me but for everyone, and has given us the gift of eternal life. My husband. He loves me unconditionally, and we have grown a lot together as a couple, as parents, and both in maturity and spirituality. He is my life partner, and he has taught me so much. My pastor. He has a hunger for God that I have not seen in many people. My mom. She's the most selfless person I know, she would do anything for anyone without thinking twice. My mother-in-law. She's an extremely hard worker, and she's one of the most forgiving and loving people I've ever met. Gianna Jessen. While I haven't had the chance to meet her, she's been such an inspiration and has encouraged me to fight for the pro-life cause, and fight to end abortion. She survived an abortion attempt in her mother's womb which left her disabled (but not defeated! ), and now is a strong voice for the unborn. I struggled to think of more than 6 (the challenge was for 10) so I left it at that. What does it take for someone to earn a spot on your list?